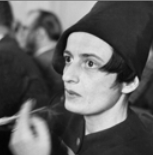 The Ayn Rand Guide to Becoming an Object of Interest ~ HELLO, my name is Blog! That’s my favorite scene from Atlas Shrugged. IN SHORT: It’s about being an object of interest in the minds of the people who matter. Is that the way people describe you? Is that the way people describe your brand? Is that the way people describe your organization? Answer: Not enough. And they need to know who you are, where you are and why you are. That’s what matters. Because if trust is a function of self-disclosure (which it is), and if trust is the only currency that counts (which it is) – if they don’t know you, you lose. No need to run around the office naked. But do find a way to give people a snapshot. A glimpse into that which the world cannot usually see. By enticing their visual appetite by dangling the carrot of fascination in front of their nose, your interestingness will skyrocket. Is the bio page on your website worth showing to a friend? What about you? Are the details of your life interesting enough to make it through dinner? Or would your date fake a cell phone call from her roommate just to get out of listening to you? That’s the power of detail. Be specific or be ignored. Are you worth writing home about? 3. Monstrously human means monumentally noticeable. Reality television is popular for two reasons. First, it’s incredibly cheap to make. That’s what happens when you stop casting actors and start using citizens. Secondly, the human factor is off the charts. This makes it easier for viewers to see themselves reflected in the people on the screen. Now, odds are, you won’t be staring in your own reality show anytime soon. But that doesn’t mean you can’t invite people for a leisurely swim in your massive sea of humanity. I’m not promoting rampant narcissism, inflated self-importance or a violation of personal privacy. Rather, I’m suggesting you sack up and show more of true self to world. Your audience doesn’t just expect it – they demand it. Give the people what they want. Take them behind the scenes. When they see that what you do on a daily basis speaks straight to the heart of the human experience, it will be hard (not) to pay attention. Turn yourself into a walking mirror. How are you fully integrating your humanity into your profession? 4. Depth is the greatest of heights. Think about the last person you stalked. Oh whatever. Don’t tell me you’ve never gone to a guy’s Facebook page (two hours before meeting him in person) and carefully scrutinized each of the three hundred pictures in his photo album. Don’t act like you’ve never spent your entire lunch hour googling the woman you were going on a date with later that week. Everybody does it. Admit it: We’re all a bunch of stalkers. But, there’s a valuable lesson to be learned: Nobody stalks boring people. The more depth you have offline, the more interesting you become online. And as long as stalkers keep it in their pants and don’t cross any dangerous lines, I say: Stalk away. It’s a high compliment. Whatever. That chick looked like Ron Howard’s brother anyway. The point is: Don’t be a flat person. Create a persona worth looking at and listening to. One-dimensional people are about as fascinating as a tube of denture glue. Are you worth stalking? 5. Demand an explanation. As a lifelong writer, science has been never my forte. And yet, I see physics as the most interesting subject on the planet. Imagine: You’re either dealing with numbers too big to imagine or too small to comprehend. Life doesn’t get more fascinating than that. And that’s the lesson: When you become the kind of person for whom onlookers demand an explanation, people can’t help but wait with baited breath. Like my mentor, Bill. The reason he’s such an object of interest is because you’re always curious what his next move will be. What about you? How do you create a sense of anticipation in everything you do? Answer those questions and you’ll attract the eyeballs that matter. What questions are people asking about you? 6. Suspend disbelief for as long as possible. 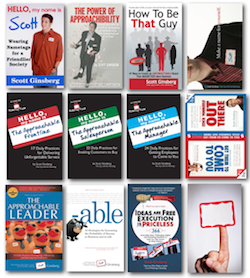 When I tell people that I made a career out of wearing a nametag, they either think I’m a liar, a lunatic – or both. What’s interesting is that the less people believe me, the more questions they ask. They simply can’t help themselves. Human beings are inherently curious beings. And part of their nature is to reduce uncertainty whenever possible. It helps people preserve their sense of control. The irony is, when you suspend disbelief and become the object of interest, you have the control. Which means you have the power. Will you use yours for good or evil? 7. Reveal the record of your origins. I love old trees. They never fail to be objects of interest because their rings, branches, roots and bark always take me back in time. Your challenge is to do the same. To give people a ride on the wayback machine. What artifacts could you use on your website, in your office or at your store to personify your humble beginnings? Remember: Customers love this stuff. Artifacts lend personality to your surroundings, humanize your organization and build the fascination and intrigue of your brand. Are the relics of your origins collecting dust or compelling eyeballs? 8. Never underestimate the intrigue of honesty. That’s the interesting thing about telling the truth: It’s so rare that it’s become remarkable. No wonder nobody watches television anymore – they’re tired of being lied to. Maybe that’s the secret. Maybe being an object of interest is as simple as not bullshitting people. It certainly worked for Scott Adams. His philosophy, according to The Dilbert Future, is to be completely honest where most people would say nothing. He’s done that for twenty years and become one of the most successful cartoonists in history. 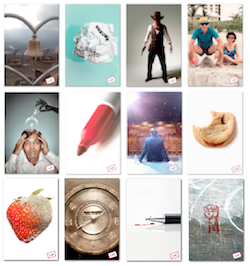 What would happen if you branded your honesty? 9. Be a synthesizer. This is, by far, my favorite musical instrument. And you don’t have to be a big fan of electronic music to admit: They’re pretty damn interesting. Probably because they create sound combinations that are outlets for emotions and feelings that can’t be adequately articulated in plain language. Now, as an individual, your challenge is to do the same: To be a synthesizer. That’s one thing all objects of interest have in common. Take Henry Rollins, for example. The reason big audiences pay big money to sit for three hours at a time – just to hear him talk – is not an accident. They do so because the composite of his synthesized experiences as a punk rocker, author, world traveler, political activist and television/radio host make him so compelling that his audiences demand to hear more immediately. No wonder he’s done over one hundred talking shows worldwide, every year, since the nineties. Remember: Be anything but monotone. Remain a consummate adventurer and you’ll remain a competitive animal. What are you synthesizing? 10. Firm up your faculty of self-expression. I watch a lot of documentaries. Mainly about artists, writers and actors. And in my experience, the reason these movies are so interesting is because the featured individuals are masters of self-expression. They create highly visual experiences with their work. Lesson learned: If you want to become an object of interest, you have to express yourself. Period. It doesn’t matter how you do it – only that you do it. And it doesn’t matter if it’s good – on that you’re willing to share it with the world. The hard part is, sometimes the theater of the mind is better. I know. Sometimes you’d rather keep your art to yourself. But if you truly want to arrest the interest of masses, you’ve got to expose (at least) some of it to the eyes of the world. Remember: Art, as Edward Debono once said, is the choreography of attention. How much of it will your self-expression earn? Ultimately, becoming an object of interest isn’t something that happens overnight. It’s the result of a life lived fully, actively and creativity. Remember that, and next time you walk into a room, it will be impossible to look at anybody else. Are you an object of interest?